After a complete sell-out in 2018 - Brimingham Seasonal Markets returns to The Bond Company for round two. Presenting Cheese Fest! 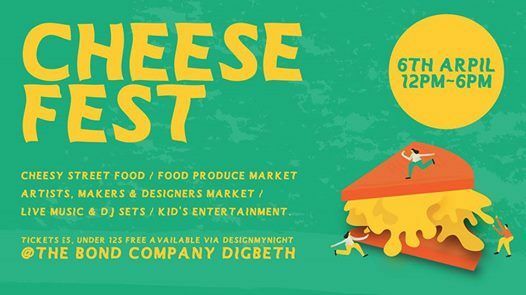 On the 6th April 2019 we're back for a one-day festival with all the cheese you could possibly wish for. 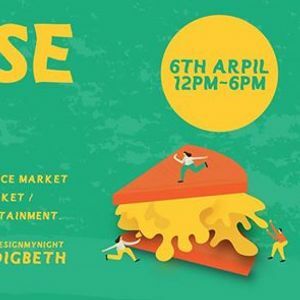 We’ll be open 12pm-6pm for cheesed-up street food, bars, DJs and a Market Hall of 25 traders selling cheese and all things cheesy. After a knock out line up in 2018 - Cheese Fest 2019 is bigger, better, cheesier, and meltier than ever! Street food & exclusive cheesy specials from: Streetchef Halloumi Fries // Low N Slow // Kilder Bar // Peel & Stone Pizza // Baked In Brick // Mac OGs // The Gravy Train Poutine // Street Souvlaki // The Paneer Wrap Street Food Co // Urban Cheesecake // Cake Doctor. As for the bars, all your favourites will be coming back - Dig Brew Co will be back with their latest brews. If beer’s not your thing, no worries. Seasonal Markets stalwarts, The Cocktail Caravan will be there introducing a new menu of spring serves, with Prosecco by the glass & bottle too! Aside from our exciting and quite frankly outrageously cheesy food & drink offering, Seasonal Markets will be hosting 25 exhibitors offering all sorts of cheese paraphernalia from cheese boards to chutneys. We’ll also be inviting our favourite artists, designers and makers to fill the hall with some an array of entirely unique crafts, gifts, designs, prints, clothing and homeware and showcase the best that Birmingham can offer. As ever, expect a full programme of music with live bands and DJ sets throughout the day. We’ve also got some free kids’ entertainments lined up too and with under 12s getting in free we’ll be hosting a fully family-friendly fromage fest! Tickets will be £5 (£3.50 early birds) and available through Design My Night but make sure you snap them up quickly – last year was completely sold out!